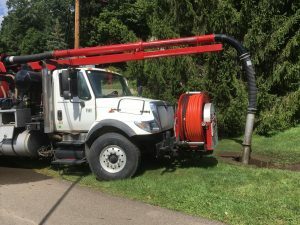 We offer the service of cleaning and vacuuming out of catch basin, lift stations and manholes on a regular schedule for the contractor, counties or small utility companies. We provide steam cleaning of grease and the ability to vac the debris and build up found in these systems. We provide jet vac cleaning of both large and small drain lines both sanitary and storm systems. We are able to do jet distances of 500-600 ft and pull the debris back to the entrance point to be vacuumed out and removed, preventing the material from being pushed farther down the line.